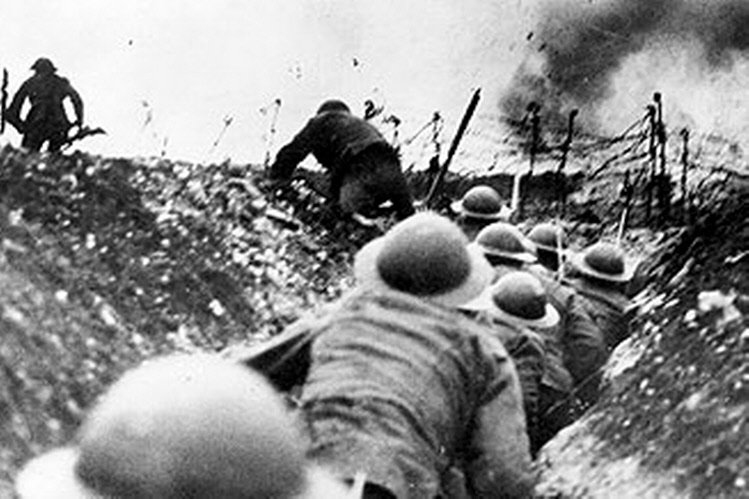 After July 2nd the first attacks on the Somme were over, but there were more planned and they would happen very soon. The British did need a few days to catch there breath and put things in order, and for the next two weeks they would be launching attacks that would keep the Germans off balance, hopefully. This would all be in preparation for the next big push on July 14th, which we will not get to until next week. The attacks between July 3rd and July 13th would have two stated purposes, the first being as I mentioned to keep the Germans off balance, and the second to try and capture a few important little areas that would be very advantageous to have in British hands before the 14th. While some of these objectives would be met, they would come at a high cost, perhaps too high of the cost. The attacks would resume on July 3rd, and on that day there were plans for two different attacks with two different objectives. 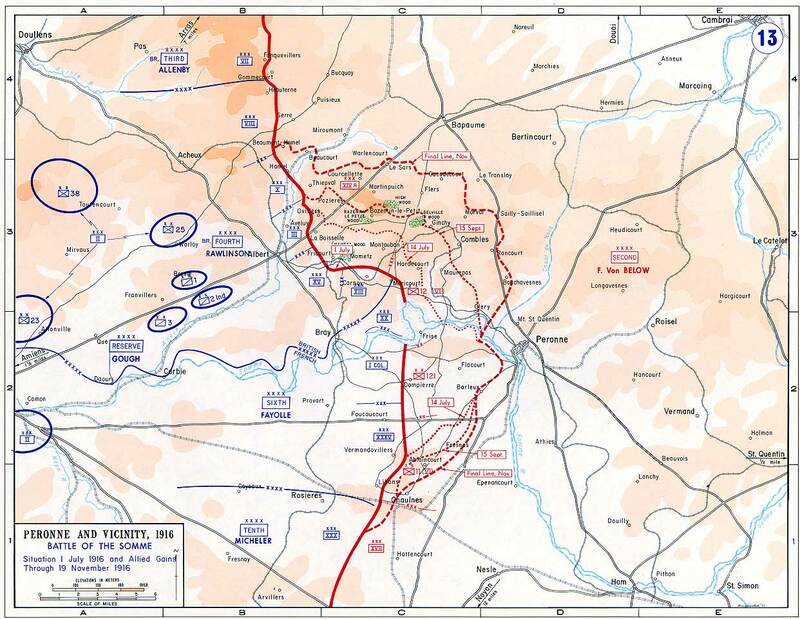 One attack would be towards the village of Ovillers and the other would be in the direction of Thiepval, both of which were right to the north of where the British had made their progress on July 1st. These were seen strictly as pressure and distraction attacks, the good old just-keep-pressure-on-them sort of attacks, and in general I am not sure there was a huge amount of hope that they would succeed in actually capturing their objectives. If these attacks could be even sort of successful though, it would keep the Germans very much off balance in preparation for the real attacks that would be launched later to the south. The men at the front were from the 12th and 32nd Divisions and the men themselves certainly did not have high hopes for what was about to happen, which of course did not stop them from going over to the attack at 3AM on July 3rd. This was a much earlier kick off time when compared to earlier attacks because the British did not have to attack in conjunction with the French, who were constantly pushing for later attack times while the British always wanted to attack even before the sun started to come up. With a few days to recover the Germans had taken the time to compose themselves, both the men at the front lines and the officers behind the front. For the infantry in the line this probably meant getting some food and a bit of rest, and for the officers it meant writing orders to those men who just wanted to sleep and eat. Most of these were general directives that were sent down to the units with the intent of both telling the men how important the fighting was, but also what was to be expected of them in the future when more attacks were launched. I have two different translations of the same order here, one from German Army on the Somme by Jack Sheldon and one from Through German Eyes: The British and the Somme by Christopher Duffy. Now, I do not usually do this but I wanted to include two different translations here just to show an example of how much a slightly different wording and a slightly different cutting of a translation can change what you see. I find this kind of stuff interesting, but do not yet know enough German to give my own take, so I guess I give these without comment. We start first with the shorter of the two translations from Through German Eyes "‘On the victory of Second Army on the Somme hangs the outcome of the war. The battle must be won by us, despite the momentary superiority of the enemy in artillery and infantry . . . For now, everything depends on holding onto our current positions at all costs and on improving them with small counter-attacks. I forbid the voluntary evacuation of positions . . . Only over corpses may the enemy find his way forward." and then from German Army on the Somme “The outcome of the war depends on Second Army being victorious on the Somme. Despite the current enemy superiority in artillery and infantry we have got to win this battle. For the time being, we must hold our current positions without fail and improve on them by means of minor counter-attacks. I forbid the voluntary relinquishment of positions. The enemy must be made to pick his way forward over corpses.” I do not think those really convey any different meaning, but it is cool how different the wording can be when translating from the same source. The first attack to go forward would be the attack against Ovillers, and it would be preceded by only an hour of artillery fire, it would go forward, it would be very costly, and it would be very unsuccessful. After the attacks nothing had been gained and there had been 2,400 casualties. The attack on Thiepval was much the same, if maybe a little worse and again the infantry were pretty much slaughtered for no gain. The problem for both of these efforts was that the preparations were simply not sufficient to even achieve their easier goal of distracting the Germans from future attacks. The paltry artillery preparation was the biggest culprit, the bombardment was much shorter than before but did not have a greatly larger number of guns behind it. There also just imply were not enough men put behind the attack on a wide enough from to keep it from being anything other than a fruitless effort. The only benefit of these attacks was that they were smaller than the attacks of July 1st, although they still cost to many casualties. The British did also learn that the Germans had abandoned a few places on July 2nd which was a happy accident really. This allowed them to occupy places like Bernafay Wood and Caterpillar wood which did move the line forward a bit, but this was all due to the Germans voluntarily giving them up, not due to some amazing attack by the British. One facet of the attacks both on July 3rd, and the continuing efforts that we are about to discuss is how unsettled the lines generally were. So many of the men on both sides were still stuck in unprepared or barely prepared positions that had often been wrecked by all the artillery fire, this put them in a situation where there was often no easy way to communicate with units on their flanks or even with the rear. This latter situation was often handled with communication trenches that just did not really exist for these men. This produced a few big problems, the biggest being water, always it was the water. Often men were forced to resort to trying to rummage among dead bodies for canteens and water bottles that still had something in them. This may have been a source of these items soon after the attack but as the days wore on they were no longer providing any amount of food and water. Captain Klasen, a German officer, went into pretty good detail while describing the experiences of both him and his men as they moved to the front around this time. They would spent 5 days and night in the front line before they were to be relieved. The first trial was to simply get to the front which meant rushing from cover to cover as the British artillery dropped fire at various intervals all around them. Klasen would use the term full of iron to describe the situation and this was just on the way to their destination. Once they arrived at the front they found themselves under constant fire from both infantry and artillery, which was annoying for sure, but more important ration parties almost never got through to the front lines. He says that only one time in five days did any ration carriers get to his troops, which seems pretty typical from what I have read. The men were almost entirely reliant with what they had brought with them, which was almost never enough. The only good news, if it really was at all, was that when units came off the line there was almost always plenty of food. It was always the goal of both German and British rear area officers to provide a good billet and plenty of hot food for units that were coming out of the front line. In early July there was often more than anybody could possible eat because the units coming off the line were so much smaller than the ones that had left those billets for the front days earlier. Some of these units were getting off the line for the very first time on July 3rd and 4th and it was not unheard of for them to have lost 3/4 of their nominal strength in the week of fighting they had experienced, there were often more than enough potatoes and other food to go around even for the hungriest of men. 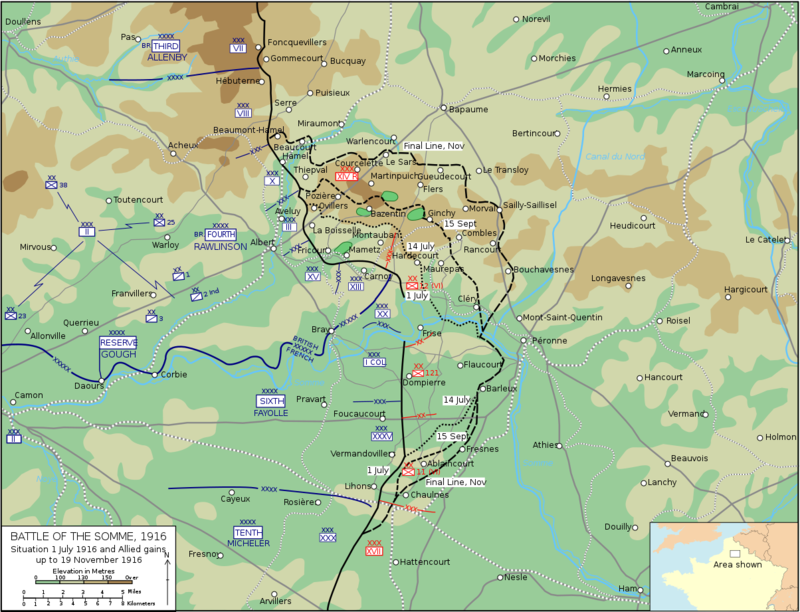 The next phase of the Battle of the Somme would sort of bridge the gap between the attacks of the first few days of July and the next large effort on July 14th which we will be getting to next episode. The goal was to keep pressure on the Germans while the next attack was being prepared, and there would also of course be some goals for different areas to be taken. These goals were specific objectives along the front that, if captured, would greatly assist in any future efforts. If you have been paying attention so far you may recognize some of these objectives in the form of Ovillers, Contalmaison, and Mametz Wood. There were sort of in the middle of the front that was attacked on July 1st and it was hoped that their capture would unlock the entire southern end of the British front for the next attack. This goal, and the hoped for outcome, were reasonable, these were objectives that needed to be captured and if it could be done before the attack they would not have to be capture during the next major attack. Unfortunately the approach that the British, and more specifically Rawlinson, chose to use for these attacks was far from optimal. The problem was that Rawlinson believed that his subordinates should be allowed to plan and execute their own attacks, he thought that he should simply tell them the objectives and roughly when it should happen and they should be in charge of how it happened. This is all fine and good, delegating is a great skill and he had many skilled Corps and Division commanders to hand control over to, however by giving them the amount of control that he did he forfeited the ability to properly coordinate all of the attacks so that they happened at the same time. This meant that when one Corps or Division would attack, it would be completely unsupported by the troops on its flanks. What would end up happening was that the division to the left or right would have launched their attack the day before, or maybe were planning on doing it the day after, or maybe even both, heck maybe the troops on the flanks had went forward in the morning instead of the afternoon, all of these things definitely happened. For example the Third Corps and the Fifteenth Corps were side by side in the line. During the same 5 day span the 3rd Corps launched 8 attacks, and the 15th launched 11, both of these meant more than one a day. However, none of these combined 19 attacks happened at the same time and actually supported each other. Anytime one group attacked most of the men were just sitting around and watching. This allowed the German infantry and machine guns to bring their fire to bear on the flanks of any of the efforts, but it also allowed the German artillery to focus all their fire on one small piece of the front at a time. This allowed the still outnumbered German guns to deliver a devastating amount of fire onto each attack in succession, something they may not have been able to do if everything was unleashed by the British at the same time. We will be covering these attacks during the 10 days or so that they happened in a geographical order from north to south starting with the attacks against Ovillers. In general the British troops in this area had quite a ways to go forward to reach the Germans in the attack. In some places the lines were still 250 yards apart, which is one hell of a long ways to go as we have discussed many times. They would also find themselves under a lot of fire as they moved closer and closer to their objective. There had not been a lot of changes to the general situation of attacking infantry since July 1st and because of this the men who were going forward were pretty much carrying the same thing as before, although I guess I do not remember they carrying quite as many bombs as described by Sergeant Charles Quinnell here before his attack "The objective was 250 yards away. Every man had a sandbag with twenty Mills bombs in it, and each Mills bomb weighs 2 lbs, so that was 40 lbs of weight. We had two extra bandoliers of 50 rounds in addition to our 150 rounds in our pouches. Every alternate man had a shovel or pick. The bombardment started at 4.15 and at 8.15 we were to go over – a four hours’ bombardment. As soon as the bombardment started the Germans’ retaliation came and for four hours we had to sit there and take everything he slung at us. We lost 25 per cent of our men before we went over." There were some high spirits among the troops before the attack, although everybody knew that there was serious danger that many of them would not survive. Here is Lieutenant Lionel Ferguson "I had a few old hands round me, as I was taking a platoon over and they kept me cheery. One man in particular was fine, keeping us all laughing by his wit. We gave out a good rum ration at 7.30 a.m. and it did us a power of good. The waiting to go over is most unnerving work. I kept calling out the time, ‘Five, four, three, two, one more minute to go. Over the top and the best of luck!’" Unfortunately all of this optimism would not translate into very good results due to the fact that the German defenders were very prepared for the attacks. The German artillery would begin firing even before the British attacks began as Captain Henry Sadler would explain when discussing one of the attacks he was involved in "We were badly shelled for about two hours before Zero by the guns that practically enfiladed the trench from the north, our left. We actually lost more men then, I think, than in getting across No Man’s Land." When the attacks got going the fire from the flanks was so severe, both from machine guns and infantry, that casualties were extremely high. However, perseverance was something that the British had in spades and this allowed them to, after many many attacks, capture and hold onto two lines of German Trenches. To the south of the attacks on Ovillers the 17th and 23rd Divisions would move against Contalmaison and here the attacks would go similar to what happened at Ovillers which is to say a lot of attacks, not a lot of gains, but many casualties. One interesting phenomenon that you see happening during all of these attacks during the two weeks of July was a good helping of confusion on the British side, especially when it came to precisely who was launching attacks, when they were launching them, and where. As I mentioned earlier in some areas of the front there were multiple attacks being launched for every day for multiple days on end and this situation made communication between units and the officers in the rear extremely important. This also meant that when communications broke down disaster could strike almost instantly, and this is exactly what happened to the Rifle Brigade of the 13th Battalion. This unit was supposed to participate in an attack on July 10th. There was one thing different about this attack though, it had been cancelled. The news of this cancellation had gotten to the artillery and to the units to the left and the right of the Rifle Brigade, there was just one problem it did not get to them in time. The Colonel commanding the unit had gotten the message, but too late, and there was no way to get the cancellation to the front line in time, even though runners were sent out for that very purpose. Because of this, when the time came for the attack, as good soldiers do, the men of the Rifle Brigade got out of their trench and went for it. Rifleman Ed McGrath was one of these men "We hadn't gone very far and our section got less and less until there were only two of us left. I remember calling to the chap I was with 'I think we're the only ones who are going to get through this lot!' Then I got a jolt in my thigh and my leg came up and hit me in the fact. It literally hit me in the face! Down I went!" I find the saddest part of this whole affair not that men went forward needlessly and were killed or wounded, there was going to be casualties even if everything went off perfect, no, the worst part in my mind is that some of the men managed to make these unsupported attacks a success. With no support on either side, some of the men managed to get to the German lines and get a foothold but their gains just were not sustainable as Joe Hoyles explains "Every Officer was wounded or killed. We onnly had one officer left, Captain Reviere. We went up this German communication trench and found a German machine gun. We killed those poor chaps. We captured one prisoner alive. I sent himi back, and just with that we had the order to retire. It was about 10 o'clock by then. Just getting dusk and after all that massacre, after we'd taken the trenches, we had to retire" I have always felt that having success snatched from units, after they had went so far to achieve it, was worse than just failing outright. Another attack that was happening at this same time was against Mametz Wood, although I doubt there was really much of a wood left where it once stood due to how much artillery had dropped on it. 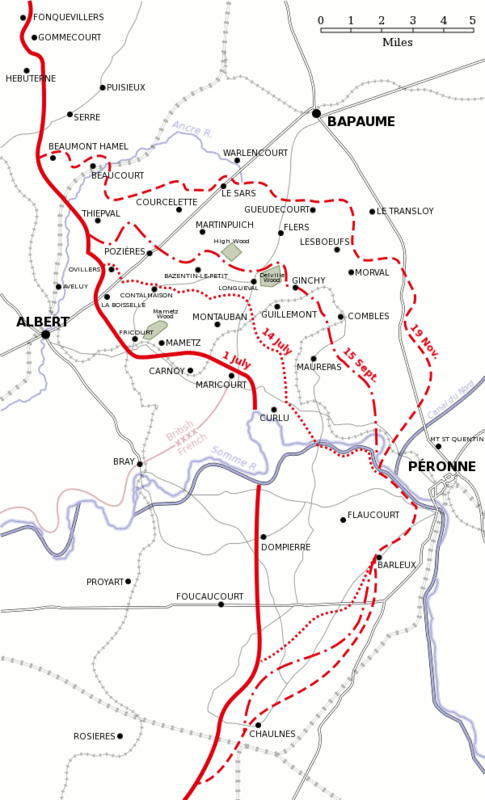 The 7th and 38th Divisions would attack against the Wood to try and capture it. They were in for a rough time, but before that started they had to hang out in the trenches for awhile. At times I come across quotes from various officers or men that dig into topics that are not generally discussed, and in this case there is a soldier who goes into pretty good detail about what he and his unit had in terms of rations right before the attack. Generally there is just some references to maybe the rum ration, but Sergeant Albert Perriman of the 11th South Wales Borderers discusses in some detail about what happened after the last ration party before the attack reached the front line "Rations for the day were issued. For fifty-two of us I was allocated one and a half loaves of bread, a piece of boiled bacon weighing about 16 ounces after the Somme mud had been removed, a small quantity of biscuits, some currants and sultanas and a petrol tin of tea. As I displayed the rations which would not be the ‘last supper’ but the ‘last breakfast’ for some of us, I reminded my lads of the parable of the ‘loaves and fishes’, adding that as I had not the miraculous powers of Our Lord Jesus Christ, section commanders should toss up – the winner taking the lot. At this, one of the lads said, ‘Say Sarge, the buggers do not intend us to die on a full stomach, do they?’" When the attack did start the fire was heavy, but not as heavy as it had been on the first day. Here is Sergeant Perriman again on what happened when his unit attacked, and also a glimpse into why officer casualties were almost always so much higher proportionally than enlisted men "Shrapnel and heavy machine-gun fire all around us spelled instant death. My officer was the first to go. I was a yard or so behind him when he fell. He fell without uttering a sound. I examined him and found he was dead. I took over, but for short duration – I became the second casualty. I received multiple wounds – in leg, stomach and hands by shrapnel. Unable to continue, I handed over to the senior NCO and I managed to crawl back to Happy Valley the best way I could. Progress was slow and painful." 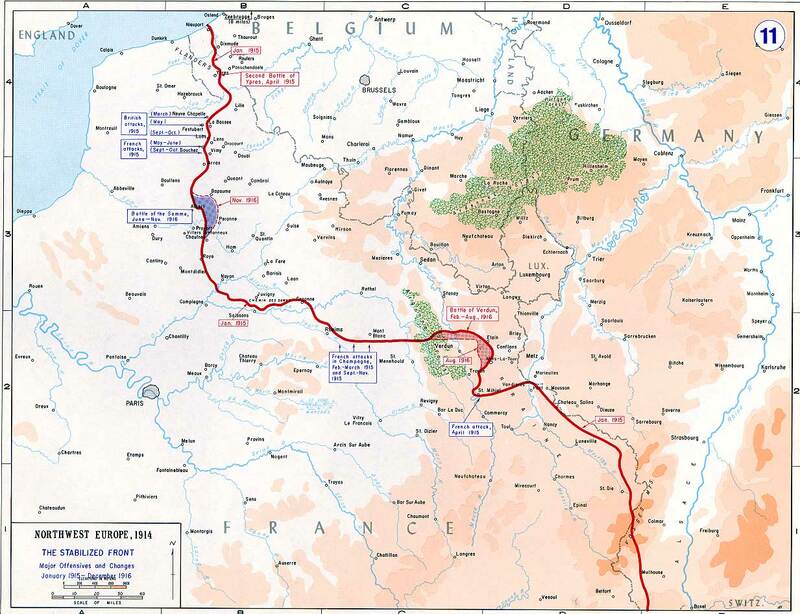 The initial attacks against the wood were less than successful than had been initially hoped, however they were renewed on July 10th and these were able to push the Germans back to close to the northern edge of the wood. Inside the woods by this point everything was a mass of confusion with positions all over the place, often not really attached to each other in any meaningful way. This resulted in several instances of both sides getting all mixed up together, sometimes slipping through right by enemy positions, and sometimes finding out only after a firefight that they were shooting at their own. It would take the British two full days after July 10th to push the Germans fully out of the wood, and the British could finally claim it as their own. One final attack, and just to put a bit of emphasis on how out of symc all of these affairs were, this one did not even start on July 7th like the rest, and instead did not get going until the 8th. This would be the attack to the south again Trones Wood which would be executed by men of the 30th Division of the 13th Corps. Here even the divisions attacks were horribly disjointed with random companies being used to attack at random times, never enough to seriously threaten the German positions. Anytime these small groups went forward they were just wrecked by German artillery and machine gun fire and any gains they might claw out were quickly erased. Attack after attack went forward, and either stopped cold or met by a overwhelming counter attack. This went on for hours and days, the attacks just kept on coming. Over the course of a week the British managed to claw out a few gains, but none were near worth the cost. In Somme: The Darkest Hour on the Western Front Peter Hart points out that one of the problems of all of the British commanders, and he specifically calls out Trones Wood as an example, was that they all lost perspective. They tunnel visioned on specific German positions on their specific areas of the front. Sure, this let them make some gains after a lot of work, and in fact four of the positions discussed today were eventually captured, however because each attack was consistently sent forward independently they were at a serious disadvantage and in warfare you pay for disadvantages with lives. The British lost 25,000 men in these attacks, half what they lost on July 1st, bringing their total up over 75,000 casualties. In many ways the 25,000 number was only as low as it was because they were lucky that the Germans were still not quite settled into the front after the shock of July 1st. But again, these attacks were just a prelude to the next big British push, which would be an attack on July 14th, so this is where I leave you for now. During next episode we discuss those attacks and I get to talk a bit about the cavalry, and if you ask any of the podcast's Patreon subscribers they were tell you that I love to talk about the cavalry.